Tools can be designed for above testing but with ability to be converted to a production tool. Production tools have the life of 100,000 units. Typical turnaround time on tooling is 3-4 weeks based on tool requirements. IMPM stocks various injection molding materials but will have your required material in inventory prior to the completion of the tool. Coupled with the in-house injection machines: 45 ton Arburg, 110 ton Demag & 170 ton VanDorn you now have the ability to get quick turnaround injection molded parts. IMPM has always been the leader in product development using silicone tooling and cast urethane parts, guaranteeing 100 shots from our silicone tool. We now offer you another avenue to for your product development needs. As always we look forward to providing you with outstanding service and quality parts. Let IMPM handle your next project. IMPM is excited to announce that is now apart of the Technology Manufacturing Aligned, a group of manufacturers with the idea that they could all better themselves by associating with each other. Currently TMA has over 1,000 manufacturers and suppliers working together through various programs and educational opportunities to foster an innovative manufacturing environment in Illinois. We’re enthusiastic to see how we can contribute and what we can learn through TMA. What happens when your production run never surpasses a couple hundred parts, or you need intensive product testing? Do you spend the tens of thousands of dollars on a hard tool, do you wait the several weeks lead time until you can hold a part in your hand? In an ideal world, you would lower cost and lead time without sacrificing part quality; in this world, silicone tooling is an ideal solution. 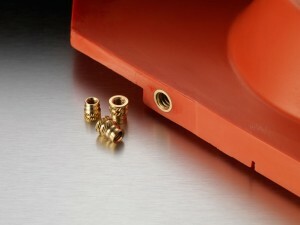 Cast urethane out of silicone rubber tools is the most cost effective, quick turnaround process. Cast urethane is produced with nearly endless possibilities of durometer, color, texture, inserts, etc. As soon as your 3D design is ready, a mold can be made in days. The entire production run can be completed in the time it would take to get a metal tool completed for injection molding. Silicone tooling, like all tooling, has a finite number of parts it can produce before a tool starts to deteriorate. This is why IMPM has never stopped managing tool quality to ensure longer lifespans from our silicone tools. We GUARANTEE 100 shots out of our silicone tools. 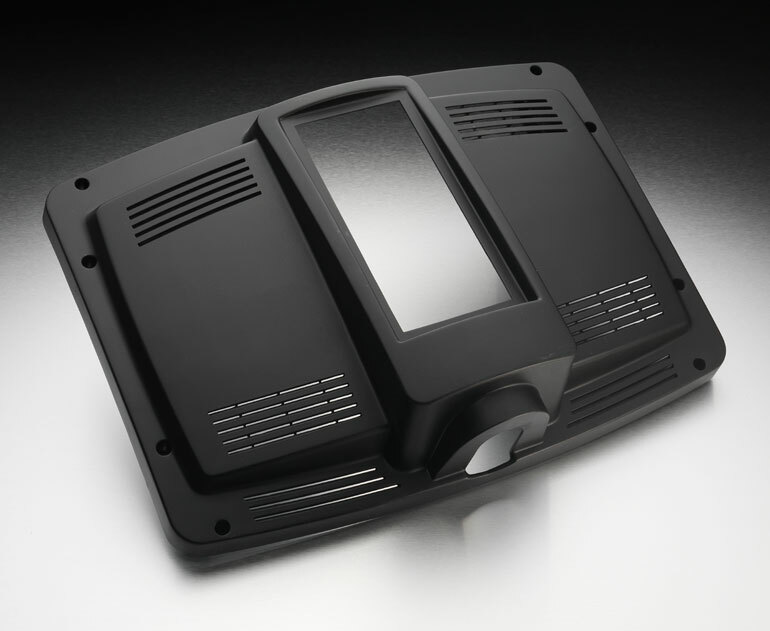 Since cast urethane is a manual labor process, every single part receives quality inspection. This means that you pay a fraction of the tooling cost that you would for a metal tool, shorten your lead time, and have production quality parts. An ideal solution. IMPM will have a booth set up at the Rapid show in Dearborne, Michigan, June 10th-12th. Find your way to booth 1327 and check out the 1400 cast urethane part project completed in 6 weeks. 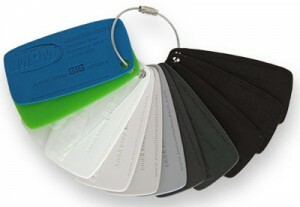 IMPM is now offering a urethane sample keyring, showcasing 12 of our most commonly used urethanes, and both SLA materials with a “Strip-and-Ship” finish. Now you can hold a material sample in your hand and literally feel what your part will be like. The detail in each sample shows the possibilities of our silicone tooling process. 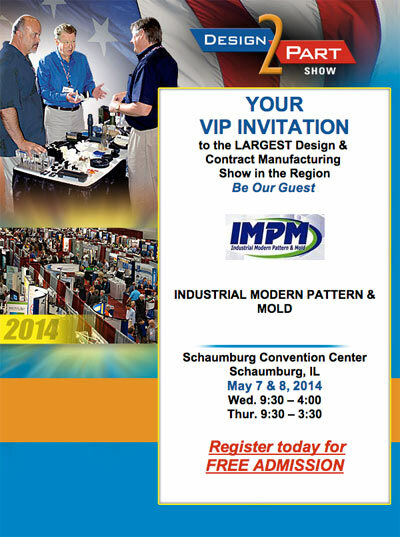 Join IMPM in Schaumburg for the Design-2-Part Show. THIS IS THE LARGEST DESIGN & CONTRACT MANUFACTURING SHOW IN THE MIDWEST! Manufacturers nationwide rely on Design-2-Part Show as the most efficient place to meet high-quality, reliable American job shops and contract Manufacturers. or Thursday, May 8 – 9:30-3:30. Our New SLA Machine has Arrived! IMPM has a new arrival, 3D Systems SLA ProJet 7000, which complements our current ProJet 6000. The addition of the new SLA machine provides you with quicker turnaround times and a larger build platform. We are excited about our growth, along with this growth though, we want to continue with the high level of customers satisfaction and quality projects. IMPM looks forward to serving all of your prototype needs. We completed some long overdue house cleaning, organizing, and purging. We also implemented a new work strategy focused on shop efficiency, while continuing to maintain our high standard of QUALITY. With these new systems in place, IMPM is able to increase our productivity and free up space allowing for future expansion (which has already begun). IMPM is very excited about the expansion of our injection molding capabilities, as we have added 110 and 170 ton presses. Unlike large injection firms who shun small runs, we specialize in low volumes, tool sampling, and are also capable of larger runs. As a full service machine shop we can offer in-house tooling as well, making it your one-stop shop. We also now offer a NEW secondary process that will give you true silver and gold colors. Using this process you have the true 3D design along with the brilliance of silver, gold and a wide variety of colors in between. The changes at IMPM have just begun with our updated website, soon to be released new marketing data, and future growth. We look forward to working with you on your next project!